Sorry I haven't posted in a few days. Friday I went to the dentist to have a root canal done, and it didn't happen. The drugs they had me take my body just didn't like that mixture. I normally just get the nitris gas, or however you spell it? Then i'm out, asleep. I was asleep at all and apparently I was not cooperating. lol My husband explained to me that I even looked at a nurse that walked by and told her I hate her. Awful it was!! I don't remember anything at the dentist except for sitting down and they put the gas mask on my nose. The last thing I remember I said it smelled like bolonga sandwiches and it stunk. Next thing i'm laying on my couch waking up and noticing my teeth weren't even fixed. It felt like a nightmare. Argh!! Oh well. So I am scheduled for a consultation next Tuesday with an oral surgeon. I hope this works out better with them. Anyways other than that, I've just been recuperating. Onto what I wanted to get posted. Last week I wanted to post a few things my sister in law got me for my birthday. 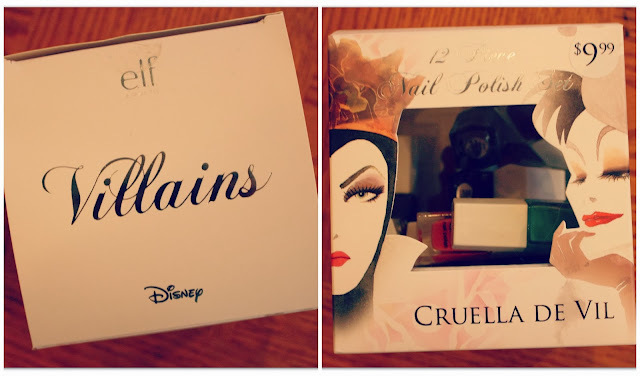 She got me some more of the Disney Villains makeup products by E.L.F. I love E.L.F., they have affordable makeup that is easy to use and just AWESOME!! When you go to E.L.F. online they also have an awesome gift section for those christmas/birthday gifts for your friends that love makeup. Anyways, She got me the Disney Villains fingernail polish pack. It comes with 12 fingernail polish's. She also got me the Evil Queen makeup bag. I just thought it was the prettiest out of the other bags. I love the look of it, very artsy. Alrighty, Enjoy the pictures!! The Evil Queen Makeup Bag. They also had Ursula, Cruella Devil, and Malificent. Scuse my nail polish in the box. LOL I already took out the cardboard that held them together. I was too excited to wait! !